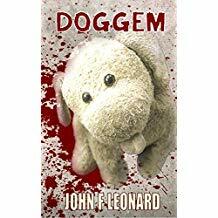 Doggem, is a short story from John F Leonard and is a tale of a toy dog and dark deeds. I chose to read this as a member of Rosie’s Book Review Team and received a copy from the author but that has not effected my review in any way. In a bid to encourage literacy Mrs Snady encourages the pupils in her primary class to take the class toy dog, uninspiringly called Doggem, home for a week at a time. The child who has him in their possession is meant to document his time in their care. George Gould, age 5, is chosen to take him home for the whole of the summer holidays. George’s parents, Cath and Tom, are taking him, and Doggem, to stay with his grandmother in her cottage in Jordemain Wood. However, it is clear that all is not well with the relationship between his parents and the grandmother, but she has asked to see her grandchild so the trip is on. And this is where the story takes a darker turn as while Cath and Tom cook up a plan, a level of perception has been brought to Doggem by George’s abilities which, while hidden from his parents, have been spotted from afar by his grandmother. Doggem gets to see and hear things he probably shouldn’t because no one suspects a toy dog and after what happens in the holidays things take an even more sinister turn when Doggem returns to school and life gets creepy for Mrs Snady as his powers increase. This short story is very well written, thoroughly enjoyable and I’d highly recommend it to everyone who wants a fairly quick read. Excellent! I loved this little story too!